Fully hardy, summer long flowers and autumn fruits. A highly attractive feature tree with the added bonus of producing glossy, versatile fruits! 'Chico' produces bright orange flowers in summer, it will look great in your garden for years to come. Glossy fruits will ripen in the sun each summer and have a wonderfully sharp flavour. Supplied as an established bush in a 9cm pot. Plant: Year-round. Flowers: June-August. Harvest: September. Fully hardy. A highly attractive feature tree, Pomegranate 'Chico' has the added bonus of producing glossy, versatile fruits in autumn each year! With deep green foliage and bright orange flowers in summer, it will look great in your garden for years to come. The leathery skinned, glossy fruits ripen in the sun each summer and have a wonderfully sharp flavour. 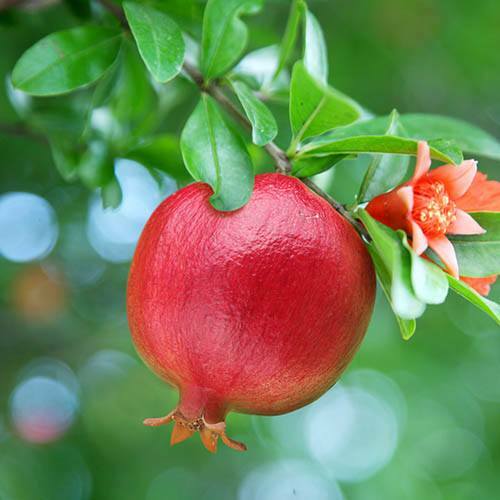 The fruits can be used in cooking sweet or savoury and taste great when made into refreshing, fragrant pomegranate juice! They are super-healthy, and packed with antioxidants. Pomegranate bushes love hot summers and your bush will thrive in a sunny spot it is perfect for a patio pot. It is completely hardy and will easily tolerate our British winters.